The year round go-to shoe! While the Revas in patent are hot, the comfy Reva in Black with Gold Emblem is still a favorite from the East Coast to the West Coast. Shop the Tory Burch Reva Black w/ Gold Emblem. Either the word prom conjures up memories of debaucherous nights, a fairy tale evening with the football team captain or anticipation of your upcoming rite of passage through high school… Limos, hotels, dresses.. If you want to look fabulous and not spend a fortune when it comes to the shoes that will top of your night’s look, definitely take a look at new Spring/Summer 2008 Chinese Laundry. The Willy (top) is available in black or metallic finishes of Gold, Silver or Bronze. This leather sandal sits on a 4″ heel and is guaranteed to be a sultry complement to any outfit! 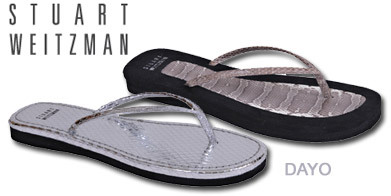 The Dilano (bottom) is available in black satin, Bronze metallic or Pewter metallic. This darling leather open-toe pump is polished off with pleating and sits on a 3 1/4″ covered heel. >>Shop these fabulous Chinese Laundry Shoes at Footnotesonline.